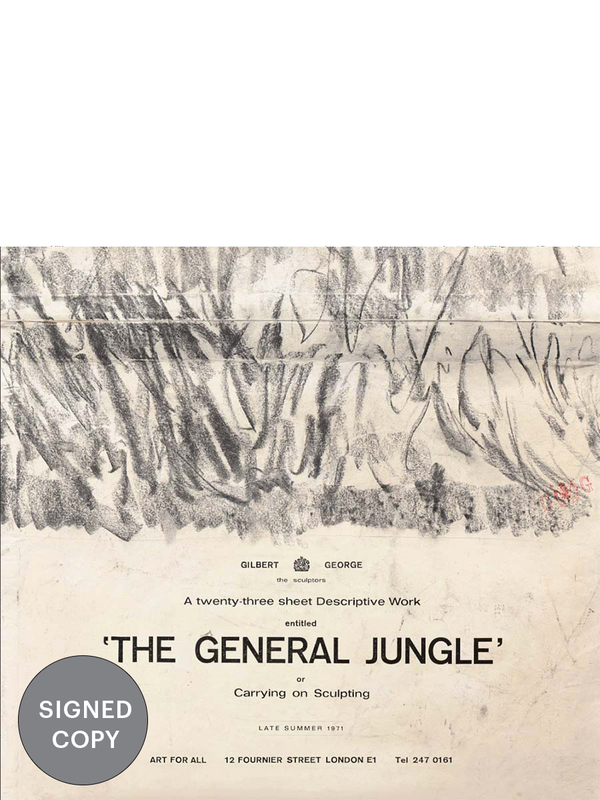 Comprised of twenty-three monumental, multi-panel pieces, The General Jungle or Carrying on Sculpting is one of the earliest manifestations of Gilbert & George’s ‘Art for All’ philosophy, reinforcing their reputation as ‘living sculptures’—an identity and belief maintained by the artists since they met at St Martin’s School of Art, London, fifty years ago this September. 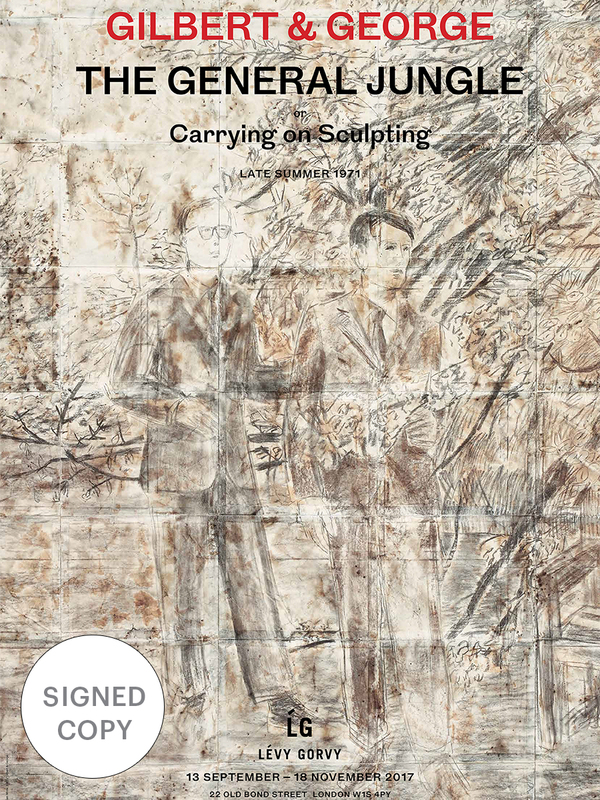 This will be the first exhibition in the United Kingdom to feature this seminal body of work, early charcoal-on-paper ‘sculptures’ by the renowned artist duo, which was first presented at the Sonnabend Gallery, New York, in 1971, as the atmospheric backdrop to one of their most celebrated works, The Singing Sculpture. 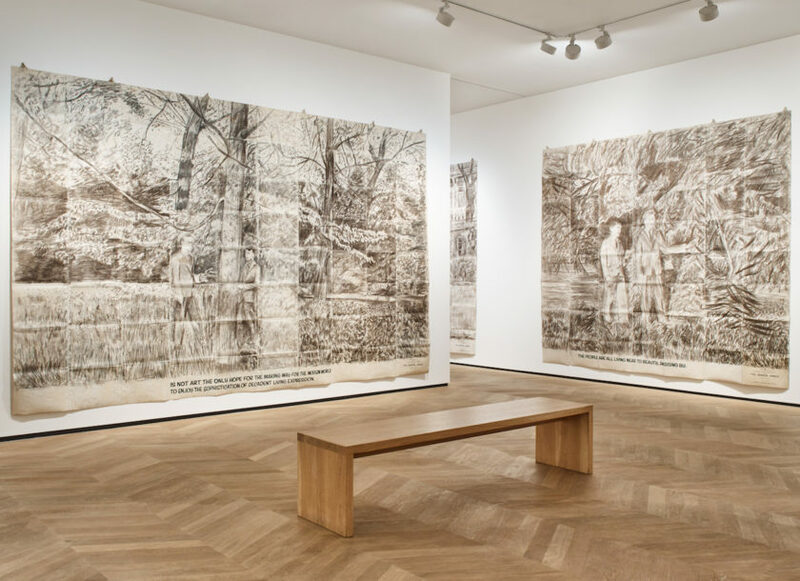 The sheets describe a day in the life of the artists (from ‘THE COLD MORNING LIGHT’, through to ‘THE CHILL OF EVENING’), as they walk through the leafy parks of London, ruminating on the human condition. Their thoughts range from the philosophical to the mundane, and hem each hanging, to read (in their own words) like ‘huge letters’, addressed with love—and humour—to the viewer. Contrary to the Minimal and Conceptual concerns dominant in art schools at the time, Gilbert & George devoted themselves to emotions rather than intellect, replacing elitist attitudes and practices towards art-making with their own Romantic, figurative idiom; by pairing inner and outer landscapes in this way, they sought to make their art accessible to the masses.